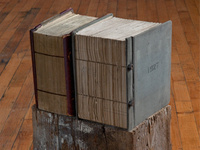 This exhibition explores the book as a site for artistic exploration, in particular, the potential for the book to offer an expanded reading experience. When we read a book we are engaging with a physical object in a very direct way. The act of reading is an inherently interactive and performative gesture. The work in this exhibit exaggerates and expands this idea of the book as an active reading experience requiring the reader to interact with the book in new ways, thereby expanding the definition and the role of the book in contemporary art and culture. Expanded Readings: The Book to Come will coincide with the CODEX Book Art Fair & Symposium in the Bay Area – an international event. A gallery talk will be held at 5 p.m. Feb. 9, followed by an opening reception at 6 p.m.